The opinions of others play a major role in people’s purchasing decisions, whether the opinions are about restaurants, movies, or apps. With respect to apps, opinions and reviews also affect how visible they will be in app store search results and how likely they will be featured on the app store. In today’s crowded app store, you’ll need more positive reviews than you have friends and family to provide them, in order to give your app the ranking boost it needs. App reviews just don’t happen by themselves, and you shouldn’t expect waves of people to head back to the app store on their own accord just to write a review of your app. In fact, probably the only people who will do so are the ones who have a really bad experience with your app! “Ask and you shall receive.” The quickest, easiest way to get an app review from someone is to ask them to do it within your app. There are a number of turn-key plugins available for iOS and Android that make it drop-dead simple to prompt the user to review your app. Appirater is a popular iOS plugin that takes about 2 minutes to drop into your app, and it will prompt users to review your app after they have used it a certain number of times or after a set time period. (There is an Android version as well.) 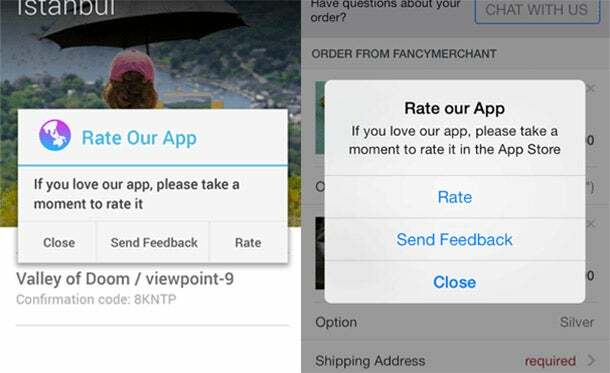 If the user taps on the “Rate” button, they are taken right to the app store where they can leave their review. Be careful when setting up Appirater, though. You don’t want to display the review popup too soon, or right after the user has downloaded your app, because you might end up with some annoyed users and bad reviews. Let’s call a spade a spade. People don’t like popups, and a great many simply will choose to ignore a standard app review popup. To really juice your app review numbers, you need to go beyond just displaying an app review popup to your users. You need to incentivize them. Does your app have in-game rewards or points? 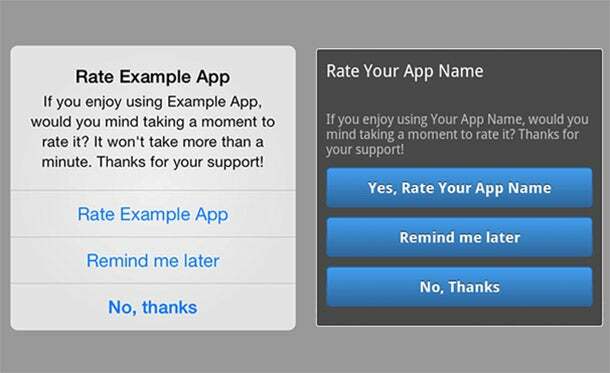 An easy and powerful incentive is to reward your users if they do choose to review your app. We all love free stuff, and the probability of someone clicking on your app review popup is likely to soar if they know they will get a gift. 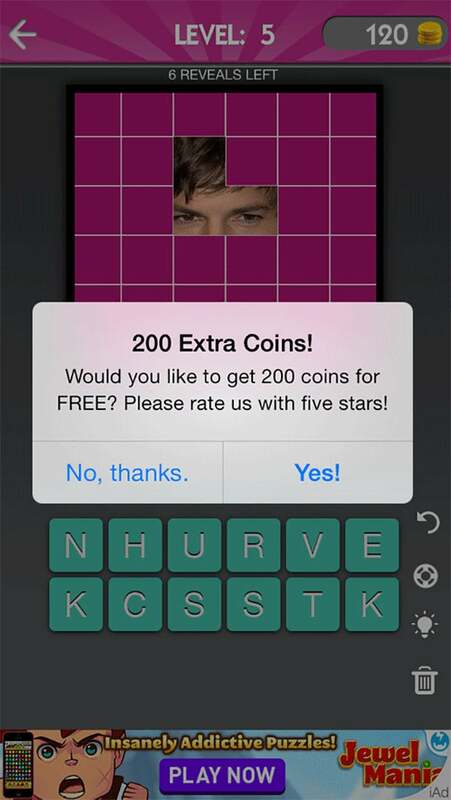 The app, Celebrity Guess, prompts users for a review after the user has accomplished the first 4 levels. While the app will reward the user regardless of whether he/she left a review, it appears this strategy is working, as the app’s current version 1.01 has gotten 29,063 reviews since December 9, 2013. You’ll need to develop your own app review popup and figure out the best way to reward your users, but the extra effort will be worth it. The best route to a good app review is to provide exceptional customer service. 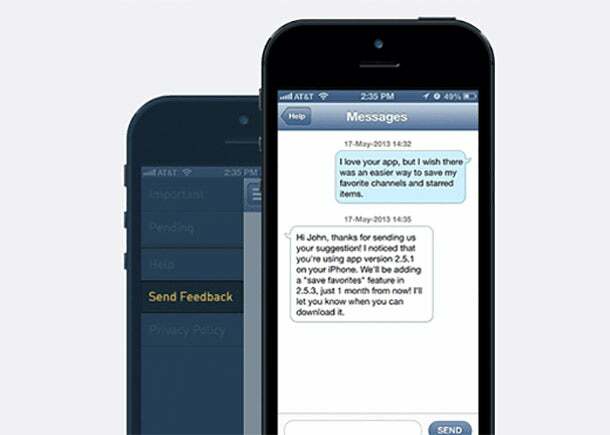 It’s common for apps to include a “Send Feedback” button that just pops open an email form. But for very little effort, you can integrate Helpshift into your app and communicate directly with your users through a live two-way instant messaging window. Helpshift provides you with a web-based dashboard that lets you exchange one-to-one messages with your users directly inside of your app. So, the next time a user needs help, you can go way beyond a pre-populated mail form and deliver a great customer support experience with Helpshift. Once you have helped your user, you can ask them to review your app and send them the link! It’s free and simple to integrate, plus Helpshift comes with its own app review popup plugin that minimizes negative app reviews by giving users a “Send Feedback” button. When pressed, the user will be taken to a live chat window (instead of the app store) where they can directly air all of their grievances about your app! While review prompts are a great way to remind users to leave a review, it’s also important to time the prompts properly within the user experience. Many apps make the mistake of asking for reviews upon the user launching the app. Unfortunately, this makes for a poor user experience, and users are less likely to leave a review because the app is interrupting the normal user flow. A better way to ask for the review is to wait until the user has accomplished something within your app or finished with his/her intended task. 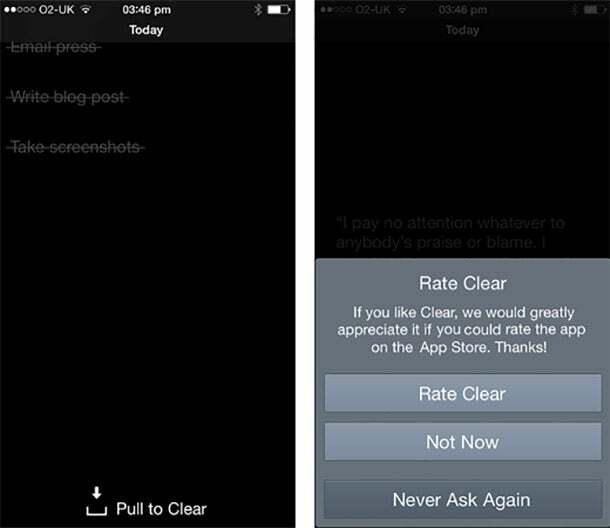 Dan Counsell of Realmac Software writes about how Clear for iOS shows the “Rate app” dialog. The prompt occurs after a few conditions have been met. First, the user must use the app for a few weeks. Second, the user must clear the remaining tasks from a list. Prompting for a review when users are feeling good about the app makes it a win-win situation for both the app developer and the end user. Another great way to increase app reviews is to run a contest on various forums. 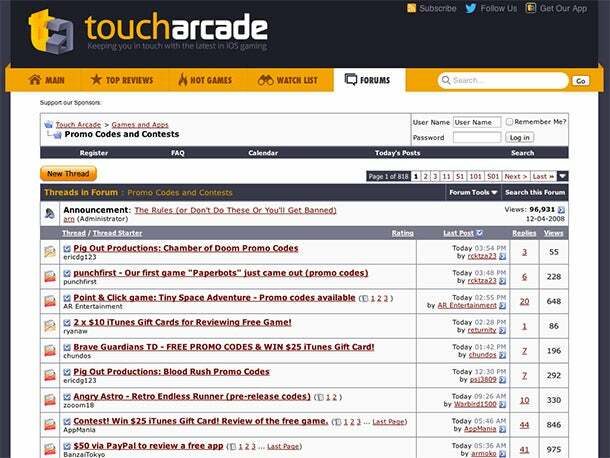 The popular blog, Touch Arcade, has a section within their forums where app developers run contests and giveaways to entice other members to leave reviews for their apps. 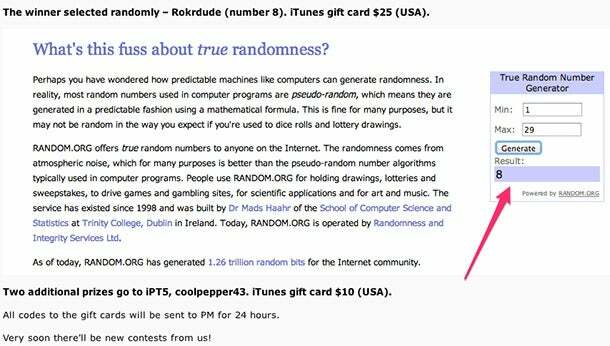 When running a contest, you can give away an iTunes gift card, or you can PayPal the winner. Reviewers will leave their iTunes or Google Play usernames as replies within your thread, and then you can select the winner randomly. To be completely transparent, it’s important to highlight who the contestants are and how you selected a winner. You can put all usernames into a spreadsheet and associate a number for each user. Then use the Random.org website to generate a number and show the screenshot to prove you were not favoring any one reviewer. While running a contest does require you to manually manage the entire process, from checking iTunes and validating the reviews to selecting a winner, it can jumpstart your app’s early and important reviews and ratings.